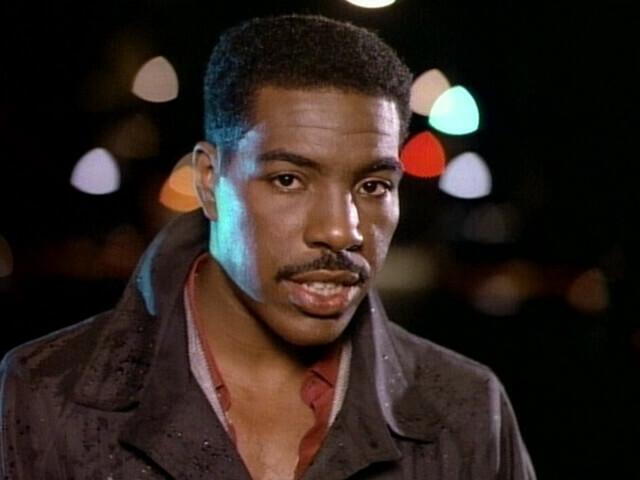 Oran “Juice” Jones’ classic hit The Rain is our Throwback Thursday. All thanks for this throwback goes to Laurence Holmes of Chicago’s 670 The Score. Produced by Russell Simmons and Vincent Bell and reaching #1 on the Billboard R&B Chart for two weeks and #4 in the UK Charts, Oran “Juice” Jones’ The Rain was a big hit. Both the song and the video depict Jones trying to catch his cheating girlfriend out in the most humorous and seedy ways. When you think of a lover scorned by infidelity in a song, more often than not it’s a woman cutting the clothes and throwing them out of the window but it’s Jones with the scissors, cutting up the credit cards and packing his things, all while his beau walks hand in hand with her fancy piece in the rain. But the funniest part is the spoken word section in the middle where Oran confronts his girlfriend about her infidelity and tells her how he’s been following her and he felt like blowing both their brains out. Oh. Kay. I don’t know about you, but he sounds a lot like another “OJ” we all know… But amongst the violence are some hilarious lines. Who knew you could throw the Trix slogan in an R&B song? Silly rabbit.